Shirtless children playing with toy swords and coating plaster on the bare skin of one another in a sort of casual casting play date. 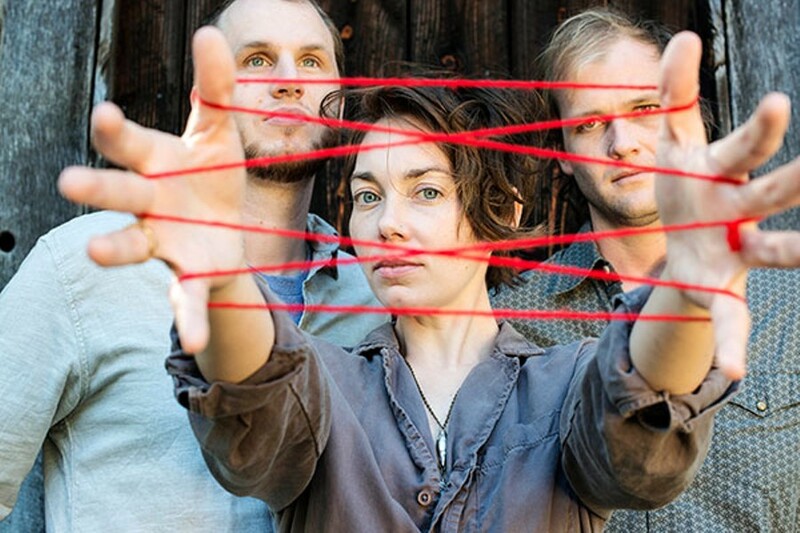 That's what you'll see in the video for Mount Moriah's "How to Dance." The song is a single from the band's third studio album of the same title. It was written by singer Heather McEntire, who came up with the idea for the track through channeling a transgender child's view. The band, based in the Triangle area and comprised of McEntire, guitarist Jenks Miller, and bassist Casey Toll, hired Alexis Bravo to shoot the playful, innocent scenes that featured her own children. In a press release about the video, Bravo describes the direction for the vid, which was shot on 16-millimeter film using a Bolex camera: "Knowing that the song is intended to be from the perspective of a transgender child, I wanted the video to somehow address those particular vulnerable feelings without being pedantic. I also wanted to celebrate the joy and freedom that comes from play in a space that the children control completely." Though these visuals add extra depth to the subject matter, the lyrical content magnifies the song's relatability. Folks from the transgender community who are continuously facing the prejudices that forced HB2 into existence, along with other marginalized groups, will understand the heart of this song. Asking questions related to dancing, dreaming, hearing and feeling, it takes an intimate, universal approach to being what some would call different or wrong. Jenks Miller reflects on Langston Hughes' "Harlem (What happens to a dream deferred)," a poem that was powerful to him as a child. It didn't influence the track but he can't help but be reminded of it when lyrics echo, "Baby, do you like to dream? Do you write them all across your sleeves? I got a lot of people telling me, how to dream." McEntire, who is bisexual and grew up in the Bible Belt, has always challenged stereotypes related to sexuality, identity and faith, but there's less hostility and vindication to being marginalized on this album. Miracle Temple, the band's sophomore album, took a heavier, more personal approach to finding acceptance in oneself rather than by outsiders' views and social norms. But there's a different, somewhat peaceful change that's gone into How to Dance. Tempos are faster, songs are grittier and more upbeat. "Thematically, the perspective was more cosmic than a personal narrative," says Miller, who continues to explain that it was a conscious decision on McEntire's part. Along the way there's a naturalist and sensate approach to spirituality. You'll find plenty of specific roadside references. 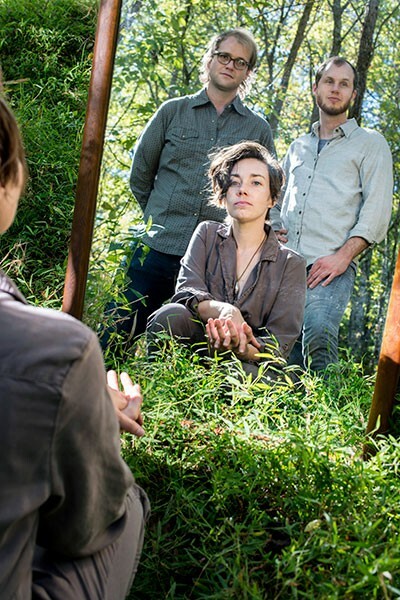 "A lot of Heather's lyrics reference very specific places we've been to and I think part of that comes from a folk tradition of being on the road and seeing different landmarks in the country," Miller says. Miller's personal favorite: White Sands, New Mexico. "It's strange and alien and it leaves an impression." He emphasizes the direct correlation between how places can embody feelings and experiences. "Including them in songs allows them to locate feelings on the map. It's not just a place, it's a feeling or what does this place actually represent." You'll also find mythical creatures like the Chiron, a half-human half-horse creature from Greek mythology. It's referred to on tracks like "Chiron (God in the Brier)" and "Cardinal Cross." "It's all fitting with the album's cosmic perspective," says Miller. "I think in that case Heather was reaching to find ways to express similar lyrical ideas about finding a place in the South, but doing so using a language like mythology that's so fundamental. And finding ways to express those ideas using more universal symbols from mythology." The group looked for places where a sense of spirituality connected for them. "We were finding elements that we can make our own and that we can relate to." Some of this came indirectly from reading books on tarot, of particular interest to Miller. They read books and studied tarot with a focus on its intricate set of symbolism and metaphors. "I'm sure there is some relationship, but I don't think it's direct," says Miller. "I think that talking a lot about tarot and its set of symbols and metaphors has played into the songwriting. Tarot provides a different frame and gets you out of the typical way you think about your life and gives you a different angle to approach things from. That's really helpful from a songwriting perspective too because it can expand the tool you have to work with there." Miller admits to doing tarot card readings for his bandmates while on the road. The group even made a quick tarot/palm reading pit stop while they were in New Orleans. "Experiencing a tarot reading might be powerful for anyone because it's allowing their life experience to be reflected back onto them in a new way. That same thing can influence a song and give you a new perspective into a character or a new perspective to a theme that you're struggling with conveying in a song."